funny funny. this made me laugh. it is slightly blurry (sorry took it on the plane) but as you can see the pictures show how to use your seat as a flotation device. i L.O.V.E. the girl in the water. reasons why this is funny: her pink dress is perfectly ballooned out around her crossed ankles. her shoes are on. her hair is like fixed and laying straight. is her head underwater? is she underwater? what? You should replace it with a picture of flames and people screaming. :) Like Fight Club. Ha ha ha. 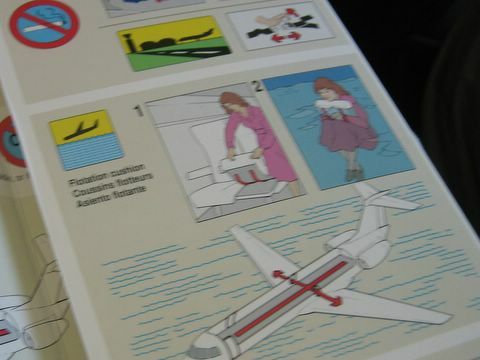 Now how do you know what you would look like if you were underwater after a plane crash? Have you tried it? While I don't recommend it, you should not make fun unless you know! ya. like i would be that f*ing relaxed going down. ha. i especially love how nicely her dress is billowing while immersed in salt water. wow.